Police are investigating the theft of a laptop from a Royal Navy officer which had held the personal details of 600,000 people. Police said the laptop was taken from a vehicle which had been parked in the Edgbaston area of Birmingham. It contains data including passport numbers, National Insurance numbers and bank details. They relate to people who had expressed an interest in, or joined, the Royal Navy, Royal Marines and the RAF. Separately, hundreds of documents containing sensitive personal data have been found dumped on a roundabout in Devon. Details of benefit claims, passport photocopies and mortgage payments were included in the confidential data found near Exeter Airport. Last November, it emerged that 25m child benefit records had been lost after HM Revenue and Customs (HMRC) sent two unregistered and unencrypted discs to the National Audit Office. The MoD said it was treating this latest theft with the "utmost seriousness". The police said they received a report that the laptop had been stolen from a car parked in Edgbaston on 10 January. "The information held is not the same for every individual," the MoD said. "In some cases, for casual enquiries, the record is no more than a name. "But for those who progressed as far as submitting an application to join the Forces, extensive personal data may be held, including passport details, National Insurance numbers, drivers' licence details, family details, doctors' addresses and National Health Service numbers." The MoD said it was writing to 3,500 people whose bank details were on the laptop's database. It said it was working with the Association for Payment Clearing Services to inform the relevant banks and ensure that accounts affected are "flagged for scrutiny against unauthorised access". Simon Davies, from pressure group Privacy International, told BBC News 24 he was "flabbergasted". "I cannot believe that our flagship security agency cannot get this right," Mr Davies said. "The idea that someone could have the computer with the information unencrypted - it is on a par with the HMRC loss." Mr Davies said the theft was "reminiscent of so many data breaches". "There are so many procedures and no-one knows which procedure is in place," he said. Information Commissioner Richard Thomas said the incident was "a stark illustration of the potency of personal information in a database world". 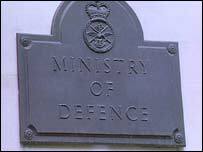 "We will require satisfactory answers from the MoD about their data protection practices and a firm assurance that steps have been taken to improve these practices before deciding on the appropriate action to take," he said. Shadow defence secretary Liam Fox told BBC News 24 that the theft was "clearly quite concerning". "I think that the police will be wanting to check in the first instance that there is no real risk of security lapses," he said. "It's just been too easy for data to go missing recently and we need to look at how to protect the details of the public." He said he had spoken to Defence Secretary Des Browne and agreed that the matter would be discussed in the House of Commons next week. Nick Harvey, Lib Dem defence spokesman, said the incident was further proof of the dangers of a national ID card system. "If anybody is entertaining lingering support for the idea... surely this would worry anybody into realising that you cannot trust any system you invent to store this much data in one place," Mr Harvey said. Douglas Young, of the British Armed Forces Federation, said: "It really is very, very worrying and I'm deeply concerned to hear this. "There must be a top level investigation." More information and advice can be obtained by emailing recruitdata@check.mod.uk from 1000 GMT on Saturday 19 January. Anyone with information should contact West Midlands Police on 0845 113 5000.